Baseball Team Plays Inaugural Game! Get your peanuts and Cracker Jacks ready for the ball game, Firebirds! 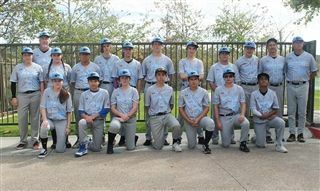 The baseball team played its game against the San Diego Jewish Academy on March 8. While the players didn't notch a win, losing 0-7, they played with pride. After the game, the team celebrated Cole Hardin's achievement as the first ever Pacific Ridge player to reach first base by giving him a Gatorade bath!